One of the biggest mistakes you can make in your business lifeisthinking you never have to telemarket. Because truth be told you telemarket every single day ofyourlife and don't even know it! Every conversation you have isanexample of marketing and someone always wins! The secret is to make certain that you are the one winning. It's quite possible that you believe that you alreadyknoweverything there is to know about telesales. However, youwilldiscover some crucial twists and turns that will make yourexistingexpertise even more powerful. 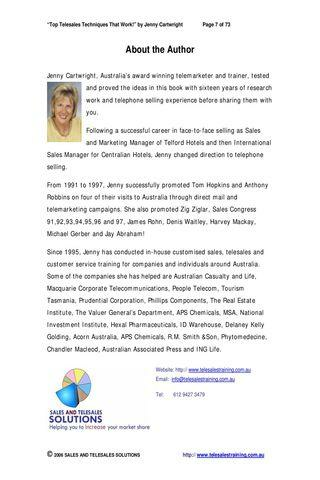 Take the time needed to really absorb and understandthestrategies revealed within "Top Telesales Techniques". Becauseitwill be a powerful, and worthy investment in yourself andyourbusiness. Put these strategies to use and you will seeincredibleresults. 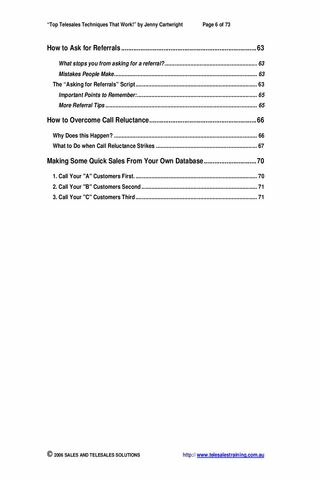 "Top Telesales Techniques" is available to download now inpdfformat. And when you do, you'll discover the exact way you cantakecontrol of the conversation when speaking to a "gatekeeper. "Youwill learn simple, but powerful methods that you can put touseover and over. Never again be left holding the phone receiver wonderingwhatjust happened! because it contains no fluff you will read it quickly and putthetactics to work immediately! It doesn't matter what you are selling nor how muchexperienceyou have "Top Telesales Techniques" will help you sellmore in lesstime and ultimately with less effort. 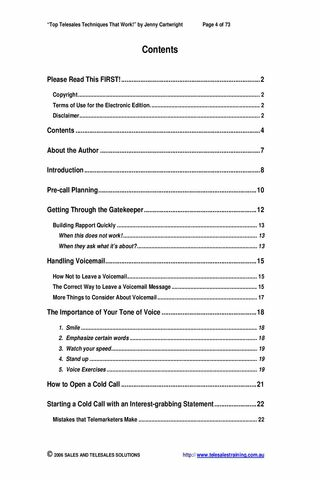 We're both busy and time is money so here is a partial listofwhat is included in "Top Telesales Techniques:"
And much, much more...every page of this incredible reportispacked with nuggets of valuable information. If you're not getting the kind of results you'd like andyouseriously want to get more, put these powerful strategiestouse. get all the appointments and sales you can handle"
Author of "The Psychology of Selling"
"There are so many great tactics and strategies here thatyou'llfind yourself using this book as a daily reference foryourpersonal success in telephone sales for years to come"
World-renowned Sales Trainer & Author of "How to Master theArtof Selling"
Those endorsements from two of the top marketers in the worldshouldconvince you that this is the best buy you'll make all year!Don'twaste another minute. Grab your copy now! We truly hope you see the potential here, and realizehowimportant this offer is! Please enojoy the preview and upgrade to full versionwithcommercial free.